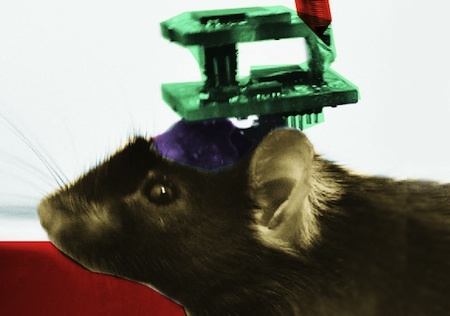 A mouse sits motionless at MIT; his actions are controlled by the brain control hat you see on his head. Boyden's mind-control helmet runs 16 LEDs from wireless power, and can be controlled from a USB base station. SF fans recall the Star Trek episode Spock's Brain, which aired September 20th, 1968. In the story, Spock's brain is actually stolen right out of his head by beautiful aliens, leaving the body behind. 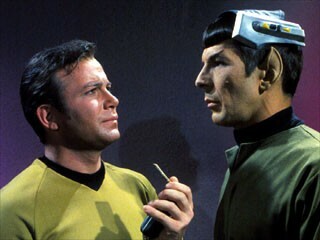 McCoy fixes up a device called a "neural stimulator" that lets him control Spock's brainless body by remote control; he fiddles with the controls on the remote, and Spock walks. Via Wired UK; thanks to Moira for the tip and reference on this story.